It's been awhile since I've done a nail post, eh? This is one hell of a comeback.... take a look at this doozy from Color Club! It's not a new polish, by any means, but Cloud Nine is one of the coolest, most dynamic polishes in my collection and I've been loving every second of it being on my nails. 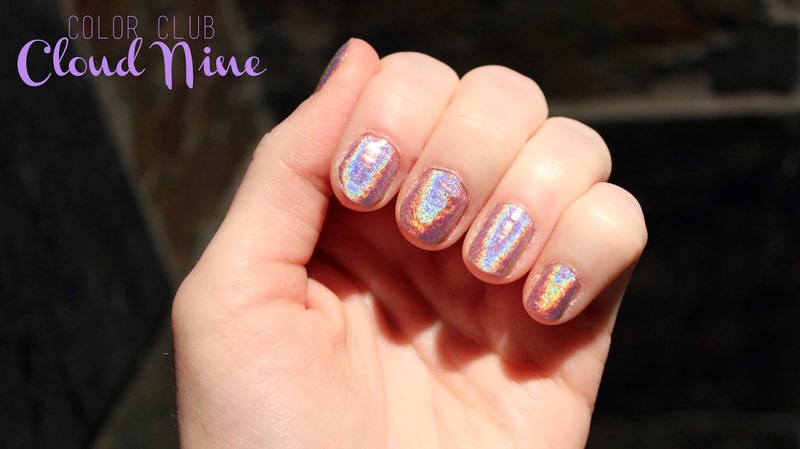 Cloud Nine is a very light pink/purple that is pure holographic goodness. I'm wearing two coats, topped off with a coat of Sally Hansen Insta-Dri top coat. While I love this nail polish so much, I do have one gripe; it chips in no time at all. Unfortunately, that tends to be the case with holographic nail polish. They look amazing on the nails, and within 24 hours you've got sizeable chips in each and every nail. As it is a lighter color, the chipping along the tip isn't as noticeable as it might be with a more bold color. I think I may get more longevity out of this polish by using it as a pedicure color in the future. I have to say, even though it chipped within 24 hours, I can't even be mad at a polish this gorgeous. I love this color! I can never find metallics like this that appear nicely with less than 5 coats haha, I need to give this one a try! This one is effortless! Highly recommended. I want one of these Color Club holo polishes SO badly! They are the coolest thing ever. So jealous of your mani!